Art by Jeff Schaller of Downingtown. You'd be hard-pressed to find a bigger art experience than the annual Chester County Studio Tour. One weekend each year, the region's many artists open their home studios, or share studio space, as visitors drive from one site to another to see where art is made. There's nothing quite like talking with the artists themselves, often in the places where they create, to give you a sense of their creative energy. The tour -- on May 16 frmo 10 a.m. to 6 p.m., and May 17 from 11 a.m. to 5 p.m. -- is about as open-ended as can be. You pick up a map (available online and at any of the tour stops), and set off. You can see as many of the 47 studios as you want over the two days. There are two maps this year, for north and south Chester County, dvided by Route 30. In all, there are about 100 artists exhibiting their works. Several locations are hosting multiple artists. Wilson Vineyard in Nottingham, for instance, will feature works by 15 artists during the tour. The tour organizers and Tolsdorf Oil Lube Express have designed a few routes with the connoisseur in mind. Courses have been laid out to help participants find the most scenic routes, or you can pick artists who specialize in sculpture, for instance, or photography or painting. Otto's Mini and Otto's BMW has supplied each artist with a 6-by-6-inch board and black frame to create an affordable, original artwork that will be priced at $75. Complete details, examples each artist's work, and downloadable maps are at www.chestercountystudiotour.com. "I love to paint and I love being outside," she writes. "Combine the two, and you get an en plein air painter. That is primarily how I paint. That is my studio. I hope to bring an awareness to the natural beauty that is around us, the impact each of us have on our surroundings, the importance of being aware and perhaps urge the viewer to appreciate and help preserve the common beauty in his or her own world." To see more of Laura's work, visit www.laurabarton.com. Using encaustic paints, Schaller uses lost and found images, words and language, to paint with a precision and intricacy not normally found in encaustic paintings. His approach is expressionistic, contemporary, and painterly, with powerful brush strokes that are set instantaneously. 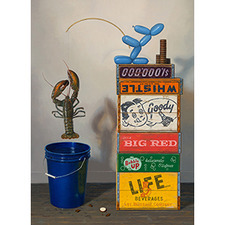 Schaller's work has been exhibited throughout the United States. He is frequently published in magazines and newspapers, chosen for juried art exhibitions and selected for special projects, commissions and murals. To see more of Jeff's work, visit www.jeffschaller.com. "While there has always been a distinction, sometimes blurred, between fine art and the decorative arts, I have long felt that useful objects can be things of beauty," he writes. "By combining wonderful wood provided by nature and a sense of form and proportion, I endeavor to create useful things of beauty. Some people consider me to be an artist, but I am quite content, and proud, to call myself an artisan. You may decide for yourself." To see more of Larry's artwork visit www.lwcrossan.com. "Right from the start of my artistic interest, I was drawn to still life," he writes. "However, it doesn't take long for still life to get stale if you follow the same recipe. Most still life resides on a table. How many tables can one look at? After much thought and looking I finally stumbled across my first soda crate and I was in love. Here were bright primary and secondary colors, text with vibrant words, wonderful patinas, all encased in a slice of Americana and destined to keep me engaged. I made a pact with myself to always paint beginning with a concept, a narrative, or idea beyond just painting for the sake of painting. My concept had to be as important as my craft. My paintings are designed to be conceptual and narrative based arrangements to stoke the imaginations of viewers. I construct little dioramas and with oil on a brush I immortalize the activity. As a matter of fact, I enjoy using the taboo of humor in my paintings and take it as a challenge to create humorous works that have a lasting impact. My hope is that others get a smile or laugh too." To see more of Robert's artwork, visit www.robertcjackson.com. Pam McKee paints botanicals, florals and still lifes with attention to detail . She has relocated to Downingtown after 10 years in the Washington, D.C., area .She is a founding member of the Flying Colors art group and teaches watercolor classes on the Crystal Cruise ships. 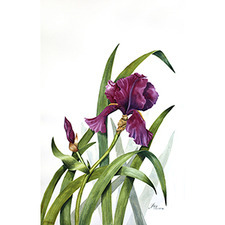 She has participated in numerous juried art shows, and taken masters classes in botanical illustration with Ann Marie Evans in London. She takes delight in painting in her newly built art studio, and helping with renovations on their "new" old house. Pam will be exhibiting at her own studio in Downingtown. "My inspirations are artists including Albrecht Durer, John Singer Sargent and Andrew Wyeth," he writes. "Art is my meditation and my therapy. For me, the pencil has always been the easiest way for me to express myself emotionally and creatively. Almost all of my work, regardless if the final piece is watercolor, acrylic or oil, they originated as a pencil sketch. When I'm adding the watercolors I go out of my way to attempt to blend various techniques to create a final painting that is as realistic as possible, combining dry brush and wet on wet. It's always my goal to transcend the medium in which I am working." To see more of Nicholas's artwork, visit www.santoleri.com. "Art is everywhere, whether or not we realize it, it is," she writes. "For me, it is this relationship between an object or feeling, thought or concept and how it appeals to my sense of form. I have found that most of my art manifests from nature. Perhaps it stems from my childhood growing up on a farm, I do not know. For me, it is when I take these images and translate them into a piece of clay that my art becomes tangible and not just a figment in my imagination. Each piece takes on a life form of its own and undoubtedly, it will unfold and explain itself through its many layers. At this point, I am merely a narrator, collaging all the pieces together." To see more of Rhoda's work, visit www.rhodakahler.com.